Have you ever wondered what a Snickers-Reese’s Peanut Butter Cup mash-up would taste like? 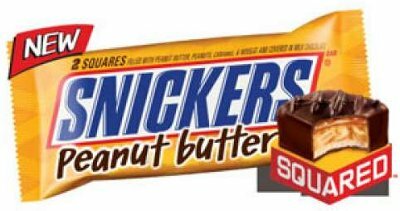 I imagine thatâ€™s what Mars Inc. was going for when the company released Snickers Peanut Butter Squared, a concoction “filled with peanut butter, peanuts, caramel and nougat and covered in milk chocolate,” as the label explains. As a fan of both Reese’s and Snickers (though Reese’s cups get the slight edge — I promise Hershey’s didnâ€™t pay me to say that), I anticipated this addition of peanut butter to Snickers bars would be divine. So perhaps my expectations were a little too high; when I bit into the Snickers peanut butter square, I wasn’t blown away. That’s not to say it isn’t tasty — it definitely is. It just tasted like a regular Snickers bar to me but with a little more peanut flavoring. Basically, if you like Snickers, I can’t imagine you wouldn’t like this. For all of you Star Wars and M&Ms fans/collectors, there are some new Star Wars M&Ms candy/toys coming soon. Details on the candy/toys are below and if you happen to be in NYC next weekend (Saturday, February 12, 2011) you can attend the launch even at Dylan’s Candy Bar! 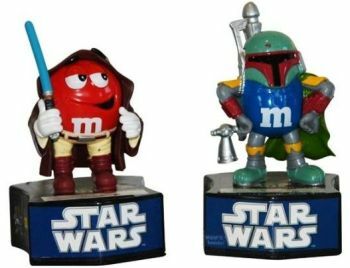 Description:	A coin bank topped with an M&Mâ€™SÂ® Character dressed up as a Star Wars personality. Available in three styles: Boba Fett, Luke Skywalker and Darth Vader. Includes a FUN SIZEÂ® (.53 oz) bag of M&Mâ€™SÂ® Brand Chocolate Candies. Skittles and I have had a pretty good relationship over the years. 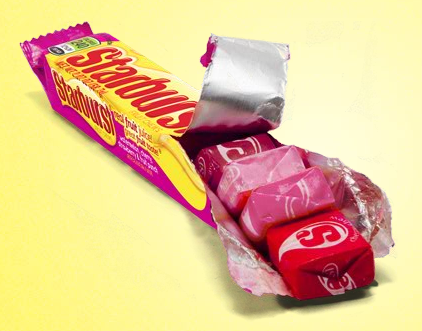 They make the bite-sized, fruit-flavored candy; I eat the bite-sized, fruit flavored candy. Itâ€™s a relationship that has served us both well. There’s also, like, a billion different flavor varieties of Skittles on that market, and I love every single one of them. Well, I guess that’s not entirely true. Iâ€™m not really a fan of Wild Berry Skittles, and I absolutely cannot stand Sour Skittles. They burn holes in my tongue, I kid you not. Recently, Skittles popped out another new variety: Skittles Fizzlâ€™d Fruits. Naturally, I had to give them a taste. Spoilers: I don’t like them. The good folks from Pure Dark recently gave me a sampling of their goodies to review here on Candy Addict. Sometimes, the candy is just so-so, but Pure Dark blows the rest out of the water. It’s intense and just what dark chocolate should be! My favorite by far was the Bark Classic. 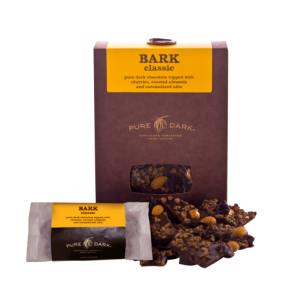 The “bark” is made of pure dark chocolate topped with cherries, roasted almonds, and caramelized nibs. It has the slightest hint of salt that perfectly balances out the intensity of the nibs. Nibs are little pieces of cocoa beans that are roasted and caramelized- but all you really need to know is that they are delicious. Nibs in chocolate = good.They remind me of chocolate covered coffee beans which is a plus if, like me, you’re into good coffee. Nibs are like the root of chocolate.